Eliminate vacuum leaks that can lead to poor fuel economy and poor performance. Premium materials to maximize service life and durability. Beck/Arnley is a leading specialty provider of premium parts for cars, light trucks, and SUVs. We provide the import parts by model and year to match OE fit, form, and performance. Our product specialists follow a unique research, analysis and procurement process known as Application Specific Sourcing. Careful attention to detail to ensure that all intake and exhaust manifold gaskets meet or exceed OE standards. For over one hundred years, Beck/Arnley has been providing premium OE quality parts for vehicles. We understand parts and deliver the OE quality that matches what was originally on the vehicle. 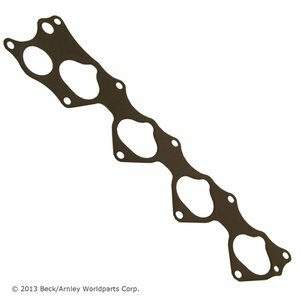 Beck/Arnley provides over 23,000 parts for 80 makes and nearly 1,800 models. With our offering growing constantly, we make great efforts to satisfy growing market trends and meet the needs of our customers.